One of the most graphically striking maps of the San Francisco Bay area. New Relief Map of the Bay Counties. One of the more graphically striking maps of the San Francisco Bay Area to appear in the early 20th century This is a scarce 1905 Whitaker and Ray wall map of the San Francisco Bay Area. 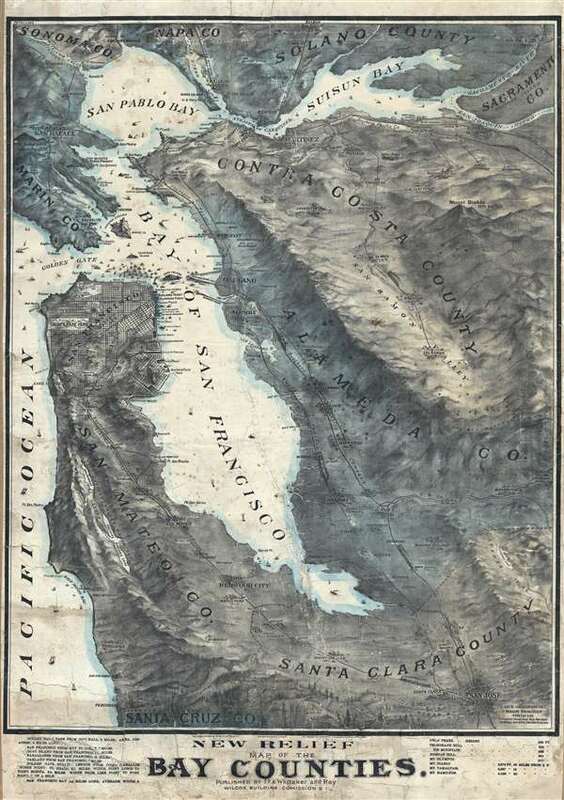 The map covers the entire Bay Area, from Napa and San Pablo Bay to San Jose, Santa Clara, and Santa Cruz. Color coding defines Bay Area counties, including Marin, Sonoma, Napa, Solano, Sacramento, Contra Costra, Alameda, Santa Clara, San Mateo, and Santa Cruz. The street grid in San Francisco, Oakland, and San Jose is evident. San Francisco itself is somewhat exaggerated in scale to illustrate the city's important institutions, street grid, business, and bustling port. As are major rail lines throughout the region. Topography and forests are stunningly illustrated pictorially engendering a gripping visual effect. This map may have been inspired by the 1895 Bancroft map of the Bay Counties, but cartographically are unrelated. The map was issued by Whitaker and Ray for the Wilcox Building Commission. The OCLC identifies only a single other example located at Stanford's Bancroft Library. Rare. Whitaker and Ray (1895 – c. 1915) was an educational supply house and publication company active in San Francisco in the late 18th and early 20th century. The firm was originally founded in 1869 as an agricultural brokerage in Galt, California, by pioneer merchants Andrew Whitaker and Don Ray (1849 - April 12, 1910). Whitaker and Ray was immensely successful when Whitaker died in April of 1894, leaving his estate to his son, James Whitaker (1874 - 19??). Now headed by Don Ray and his son John Ray, the firm relocated to San Francisco and changed focus to publishing and educational supply. The firm incorporated in 1895 when it acquired the educational supply arm of the Bancroft Company, including the services of educator C. C. Adams and businessman Charles M. Wiggin. Wiggin previously headed the educational department at the Bancroft Company and moved, along with the sale, to manage Whitaker and Ray. They began publishing educational materials under their own imprint as early as 1896, but the bulk of their publications were issued between 1899 to 1906. The 1906 San Francisco Earthquake and Fire adversely affected their interests, ruining their original premises at 723 Market Street. Nonetheless, by 1909 they had established themselves at a larger more central location at 779-760 Mission Street. Around 1910, following Don Ray's death, their imprint changes to Whitaker and Ray-Wiggin Company, reflecting Charles Wiggin's ascent to partner. They continued to publish until at least 1915. Good. Professionally stabilized and restored. Relined with fresh linen. Some soiling, cracking, and margin loss.